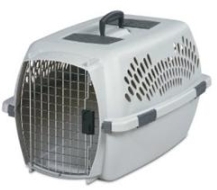 Pet travel kennel. Meets airline travel requirements. Convenient quick latching system. 2 storage compartments for food and other supplies. 4 sided ventilation so pets can still breathe freely. 2 storage compartments for food and other supplies. 4 sided ventilation so pets can still breathe freely. Pet travel kennel. Meets airline travel requirements.